This event will take place on May 19-20, 2014, in London, UK. 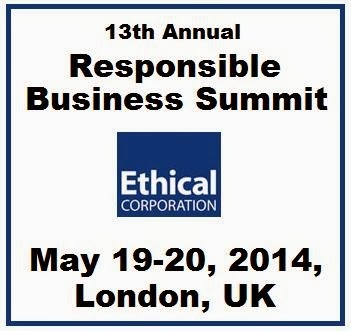 The Responsible Business Summit is Europe’s leading conference on corporate sustainability. This event is brought to you by Ethical Corporation which provides business intelligence for sustainability to more than 3,000 multinational companies every year. They publish the leading responsible business magazine, website, and research reports. Their conferences are widely recognized as the best in the field of corporate responsibility and sustainability. Life cycle innovation: How to build sustainability into product and performance, reducing negative impacts and achieving efficiency Inspire your people to come up with innovative sustainability ideas. Neste Oil Corporation and more!